Hearing aids have come a long way since they were invented in the early 1900’s. Nowadays the technology allows a user to pair their hearing aids directly to their iPhone & Android, streaming audio directly to their hearing aids, be it a telephone conversation or their music playlist. Hearing aids can, in addition to amplify surrounding sounds, function as your premium Bluetooth headsets. Since this type of technology is relatively new, only a handful of manufacturers have been able to implement this feature into their platforms. Read on to learn more about what each of these manufacturers offers in terms of functionality and style. Oticon Opn connects directly to your iPhone, so you can use your phone like everyone else. Use your hearing aids like stereo headphones to talk on the phone or stream music directly to your hearing aids. Control volume and switch programs with just a tap of your finger. Turn your hearing aids into wireless stereo headphones so you can enjoy your favorite programs at the volume you choose. The TV Adapter connects to almost any audio device using the cables provided. Stereo sound from the TV streams directly to your hearing aids from a range of up to 45 feet. The Oticon ON App lets you adjust volume, switch programs and check the battery level. The app also offers a convenient “find my hearing aid” search feature, counseling advice and links to user instructions. 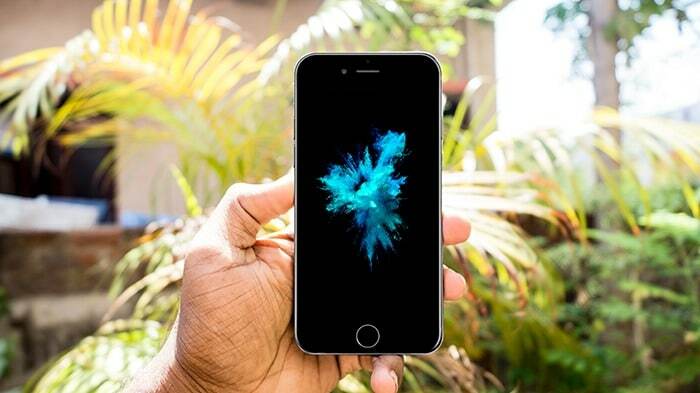 Oticon Opn and Oticon ON App are compatible with iPhone 7 Plus, iPhone 7, iPhone SE, iPhone 6s Plus, iPhone 6s, iPhone 6 Plus, iPhone 6, iPhone 5s, iPhone 5c, iPhone 5, 9.7-inch iPad Pro, 12.9-inch iPad Pro, iPad Air 2, iPad Air, iPad (4th generation), iPad mini 4, iPad mini 3, iPad mini 2, iPad mini, and iPod touch (5th and 6th generation). Oticon Opn is the world’s first hearing aid that connects to the internet via the If This Then That network (IFTTT.COM). Want the lights to turn on automatically when you switch on your hearing aids? 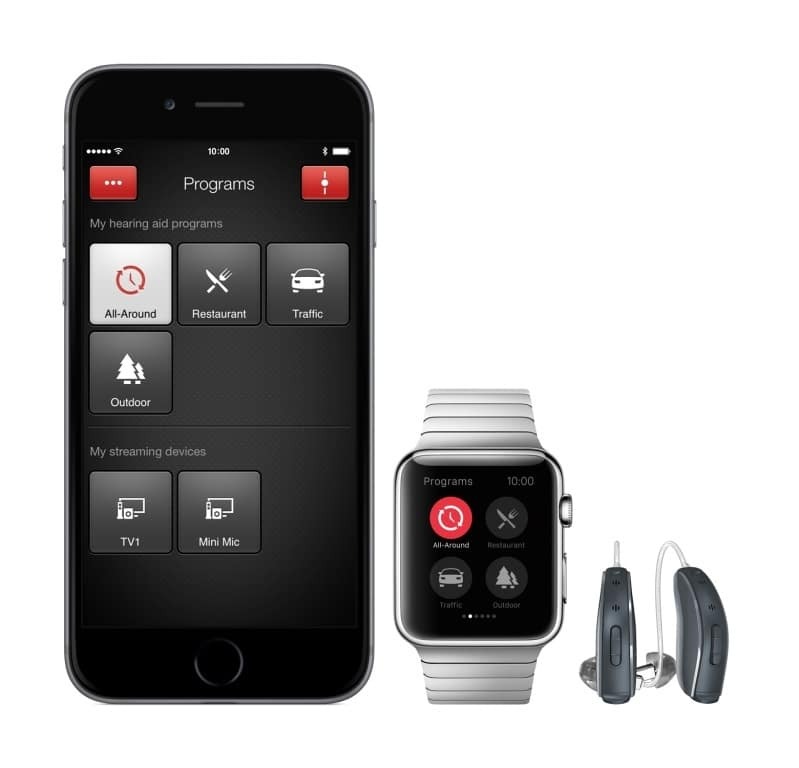 Want to be notified in your hearing aids when someone’s at the door? Explore the limitless possibilities available and craft your own connections to a range of IFTTT-enabled devices used in everyday life. 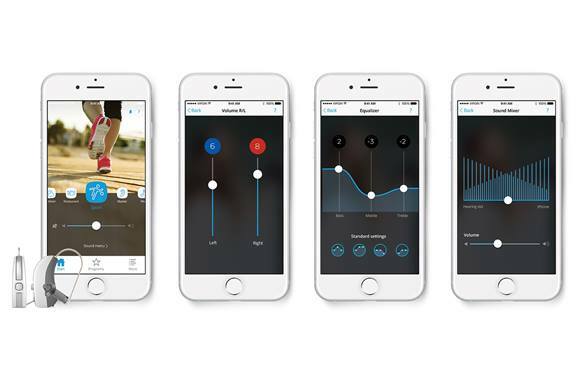 Make the BEYOND hearing aid your own with the personalized app. You can adjust sound settings and listening preferences, use personal pictures and even create sound templates for specific listening situations – such as being at a restaurant or with family and friends. Adjust volume on two hearing aids individually. Choose between clarity of speech and comfort. Select directionality of microphones. These are all features you can control with your iPhone. The BEYOND hearing aid doesn’t just keep you connected to your iPhone, but also to telecoils and to phones, televisions and more with the DEX range of communication solutions. The BEYOND hearing aid gives you incredibly advanced overall sound quality. It optimizes sound based on your environment – so you don’t have to find the most ideal listening conditions: they’re created for you no matter where you are. With ReSound LiNX² you’ll discover the benefits of Smart Hearing that adapts to you and your lifestyle. The ReSound Smart app is available for free download from the App Store for iOS devices and Google Play for select Android devices. Discreet control of volume – Adjust volume, treble and bass on the go. Change program on the go – Create favorite programs and have your hearing aids switch to them in particular places – or activate them yourself wherever you are. Easy-to-learn tips and tricks – Look up information about your hearing aid such as what each ‘beep’ means. 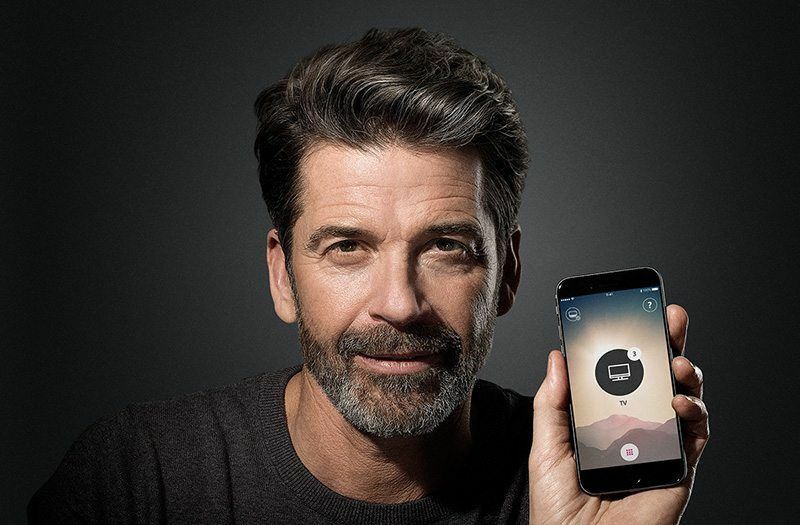 Find mislaid hearing aids – If you misplace your hearing aids, you can quickly track them down with the ReSound Smart app’s ‘Finder’ function. Balance your sounds – When you are streaming audio from your TV, music system or computer, you have separate volume controls for the audio and your surroundings. Save your favorite settings – You can save your favorite program settings in ‘Favorites’ so you can activate them when you want, and show them to your hearing care professional next time you meet. 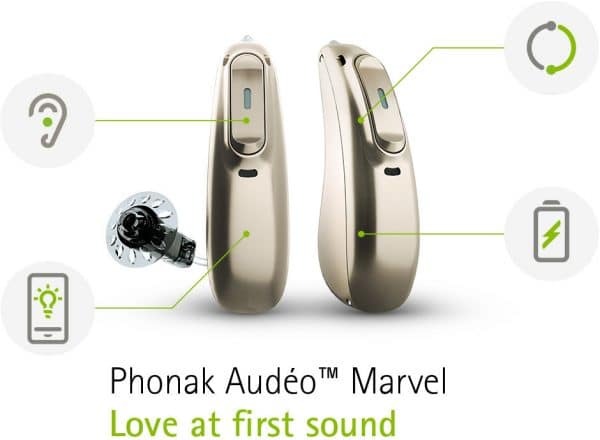 Phonak Audéo Marvel can connect directly to either your iOS or Android smartphone or other Bluetooth® enabled phones. With Phonak TV Connector, a simple plug and play solution you can enjoy your favorite TV programs and movies. Use Marvel hearing aids for hands-free calls and for listening to TV, music, e-books, podcasts and so much more. Always in top rated sound quality when streaming. It’s just like using wireless headphones – except maybe even better, because Marvel hearing aids can distinguish between streamed speech and music signals, and automatically adjust to give you an optimized sound quality. Phonak’s new digital service platform is dedicated to improve your personal listening needs. By using the myPhonak app you get access to the Hearing Diary and Remote support services so that your hearing care professional can customize your personal listening experience in real-time. Depending on your situation, you may have more questions or you may want to book an appointment to assess your needs. Either way, give us a call and we’ll assist you on the next step to hear better! 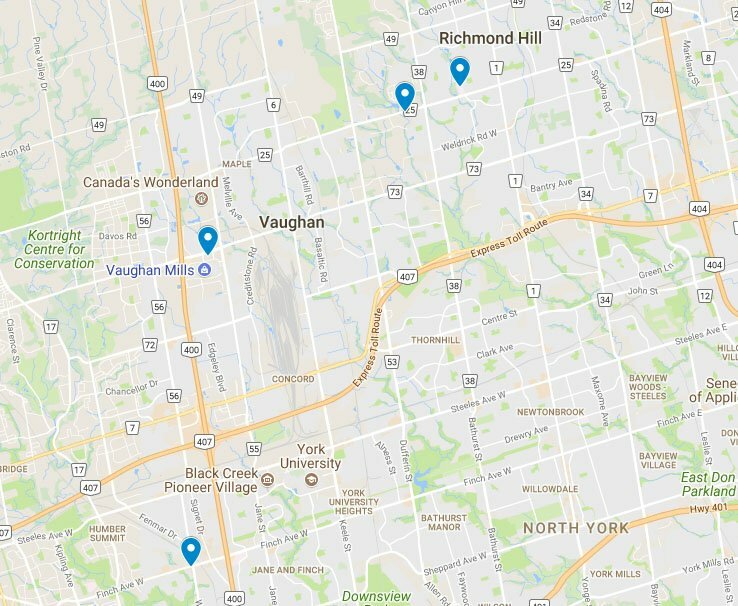 Four convenient locations in the Greater Toronto Area to serve you! Click Here to See Our Amazing Google Reviews!